It is time that the evangelical movement sees itself for what it is: a lion on the loose that no one today seriously fears.“ So wrote Carl F. H. Henry in the very year Newsweek dubbed ”The Year of the Evangelical" (1976). Harold John Ockenga was wont to be more optimistic. But two years later, even he was worried that the New Evangelicalism was fraying around the edges. “Great visibility is being given today to the word 'evangelical' and to the evangelical movement,” Ockenga wrote in a volume to honor Wilbur Smith, another erstwhile optimist. 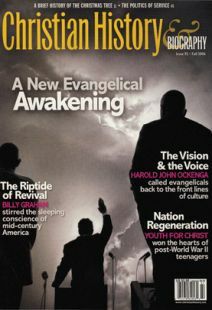 “Hopefully, it will not be vitiated by a division of the movement or by a loss of fidelity to evangelical content and practice.” By the end of the 1970s, despite their notable fame and fortune, the New Evangelical leadership had several weighty reasons to fear that their movement had started to slip between their fingers. During the early years of the movement, the New Evangelicals largely succeeded in their efforts to re–engage American culture. By the end of the 1950s, their ministries were thriving. Their numbers were increasing, as was their clout in the realms of politics, education, and the media. During the decade of the '50s, in fact, more Americans joined a church than ever before in history. More than 60 percent of the nation belonged to a church by 1960. Many now looked to the likes of Billy Graham, Carl Henry, and Harold Ockenga for leadership of global evangelicalism. But as the movement grew it also began to diversify, exceeding the grasp of the New Evangelicals. Graham and company tried their best to keep their growing family together. But despite their recent success in reviving fundamentalism—and American culture at large—some of their siblings became uncomfortable with their leadership. In the 1950s, Graham made changes in his methods—such as desegregating seating and including non-evangelicals in his crusades—that upset some fellow conservatives, especially in the south. Right-wing fundamentalist leaders opposed Graham publicly and encouraged their constituents to turn their backs on the evangelist. During the early 1960s, the New Evangelicals also began to divide on theological grounds. Fuller Seminary softened its stand on biblical inerrancy and in 1970 dropped the doctrine from its theological statement, causing widespread controversy. Eventually the debate faded from view, but resentment still simmers in some circles. Evangelicals differed on other theological issues as well. During the 1960s and '70s, many younger evangelicals heralded liberal social views, speaking out against their elders' social and cultural conservatism. Led by Jim Wallis, they took their brothers and sisters to task for abandoning civil rights, supporting the war in Vietnam, and failing to act consistently for social justice. The swelling number of Pentecostals and charismatics within the evangelical ranks also added to the conflict over evangelicalism's nature and destiny. Beginning especially in the '60s, evangelical leaders were faced with widespread conflict over things like speaking in tongues, faith healing, and power evangelism—not to mention charismatic, or “contemporary,” worship. Questions of doctrine, practice, and worship style were not the only factors that contributed to the growing diversity of the evangelical movement. It was also beginning to have a very multicultural face. The benchmark Immigration Act of 1965 helped Hispanic and Asian-American evangelicalism to flourish, contributing several million new Protestants to the movement. Anglo-American evangelicals have remained largely ignorant of the scope of this development, and have yet to offer much in the way of outreach to or with these brothers and sisters in the gospel (especially the Hispanics, more of whom are working class). Nonetheless, theirs will likely be the next major chapter in the ongoing story of the evangelical movement. It has become rather obvious over the course of the past half century that larger-than-life leaders like Billy Graham cannot unite all evangelicals, at least not by themselves. Their movement has grown too big. Moreover, we live in a day when Christians often celebrate diversity as much as they work for unity. This does not mean, however, that the New Evangelical aspirations to oneness in Christ were in vain. It simply means that evangelicals are past the days of defining themselves primarily in opposition to “mainline” Protestants, whose churches have less and less to do with many younger evangelicals. Evangelicals lost the battle for control of the mainline. But they won, or at least are winning, the larger war for Protestantism. In fact, it might be said that they now compose a new “mainline,” one that is far larger and more diverse than the one they lost in the 1920s—even the one they re-engaged in the 1930s, '40s and '50s. Today, they face more global challenges—those of a privileged majority, not a dissident minority. Fresh leadership is required, as well as a new, global vision, a humbler spirit of partnership, and a stronger support for the common good (especially the welfare of the poor). Guiding their movement will be difficult. Their leaders will have to unify a larger family than ever, one with a host of historical reasons to keep each other at arm's length. But if they take a look around them, they will discover a wealth of capital in evangelical history for getting the job done. Douglas A. Sweeney is associate professor of church history at Trinity Evangelical Divinity School.